I've lost count of how many hours I've spent working on the rough draft (it's only the rough draft!) of these two pages (it's only two pages!) 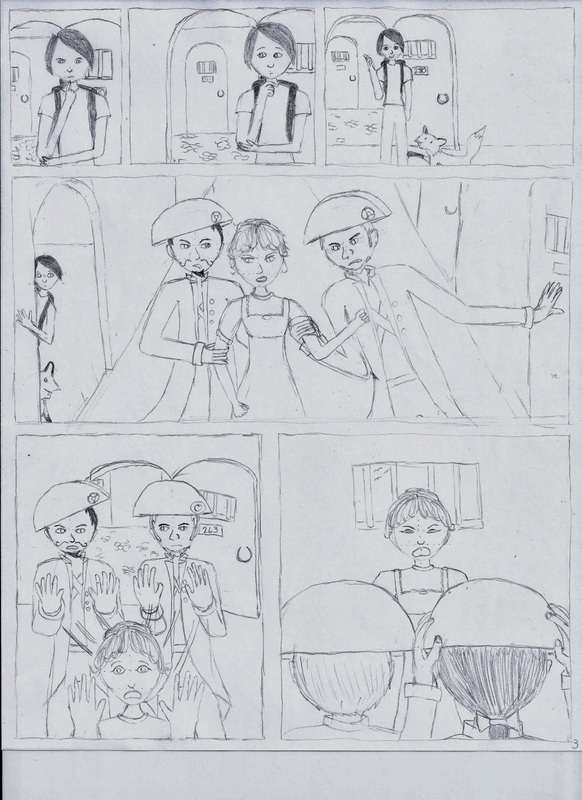 of my final project for my graphic novel class. Now it's very late, and I still have other things to do for tomorrow, and I'm getting hungry again, but at least I've got these pages done. This is a partner project. I'm doing the art. My partner's doing the words. 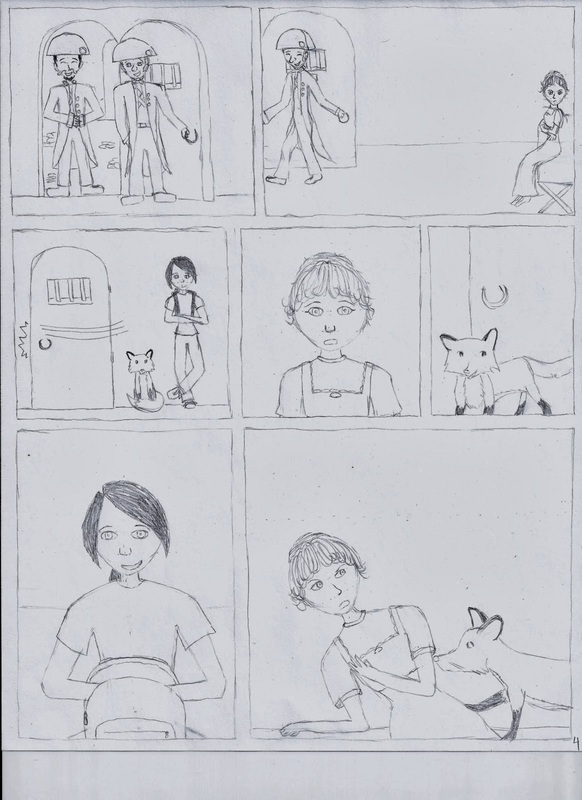 The way it's working so far is that she writes a rough script, I draw some panels to go along with the script, and then she goes and fills in the speech bubbles and narration boxes. Ay yi yi. I've had it up to here with this drawing business. And we're only four pages in. Into the rough draft, that is. Originally I'd planned to do just a quick layout on each page to turn in as the rough draft, but then I realized how much work I'd have left to do at the end of the semester when it's time to make the final product (and I'm simultaneously writing final papers and studying for final exams). So I decided I'd put a fair amount of effort into the rough draft and just fix it up later before I ink it (or whatever the heck we decide to do as far as color and stuff. we don't know. we haven't gotten there yet). And I think that's a good idea, but I realize now that just one page is going to take me several hours. Good thing I started last night, or I'd be in a very bad spot right now! Here are pages three and four of Dreamlocked, in which the main character is trapped in a dream and must fix the historical inaccuracies in it (in this episode, find Marie Antoinette after she escapes from prison) or she'll never wake up. That, by the way, sounds like exactly the kind of problem I'd like to have. There's no text- I'm only the penciler today. If you want, you can make up captions for the panels and leave them in the comments. It'll make me smile. If you're wondering why it's so dark, I was fiddling around with the contrast on my scanner to make the pencil lines show up more clearly. I'm making progress with technology! Hi, Rebecca. Your dad posted something a couple weeks ago that led me to your blog. Just an FYI, comic book artists typically do about a page a day (6-10 hours). That's either penciling or inking, not both. I just read that, at his peak, Jack Kirby did 5-6 pages a day. I'm pretty sure if you asked any of today's comic book artists, they'd tell you that's insane. You seem to be working on a variation of the Marvel method. In that, the writer gives the artist the plot, the artist draws it, then the writer goes back and writes the script. I'd also read that professional comic artists do about a page a day, which makes me unsure why I thought I could pencil two pages in just one evening. Jack Kirby is a legend and an inspiration to us all. Incredible. You hit the nail on the head! Everything I do on this project is somehow related to the Marvel method. Frankly, Marvel is all I know. I've only really read Marvel comics, and I'm using Stan Lee's How To Draw Comics to figure out how to do... just about everything. 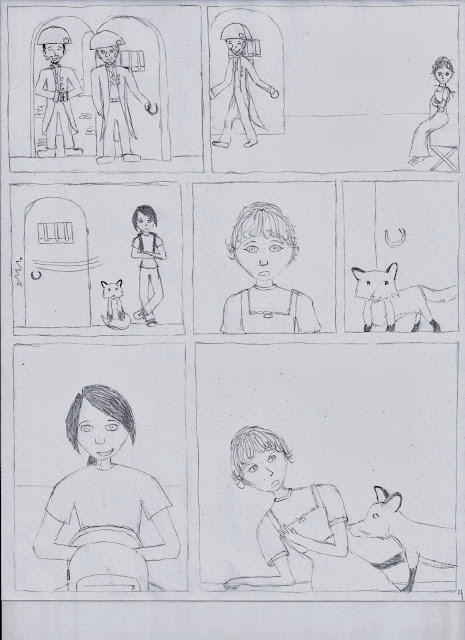 At first, my partner and I tried sitting at a table together and discussing what would happen in each panel, after which I would sketch it out and she would do some rough lettering, but that turned out to be pretty inefficient. We thought that swapping the pages and scripts back and forth would work better for us, and it has so far! Have you checked out Scott McCloud's _Making Comics_? I haven't read that one yet, but I read his two previous books. I haven't, although my graphic novels professor recommended it to the class. I'll have to find a copy. Thanks for the tip!